As add on, the constant updates from the author in Facebook added to the restless. The curiosity only heightened when I read the preamble. It was tempting and turned me nostalgic! As I started reading the book, the acknowledgment itself touched my heart. It seemed to be straight from the heart. A smile never left my face. As a reader, I felt special... As if the author was thanking to me personally! 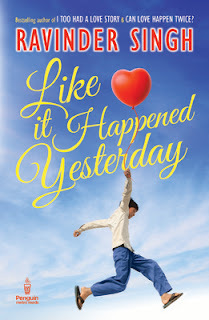 Like it happened yesterday is a beautiful collection of certain events straight from the life of the author. It talks about his life up to that day when he got enrolled himself in the college. Thus the story carries oodles of genuineness and tons of innocence. 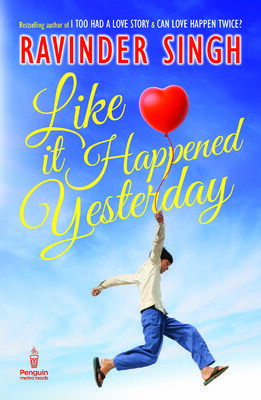 The flow of the narrative is impeccable; the words also maturing with the protagonist – Ravinder. Yet, there was a moment when I wondered why I am reading the autobiography of a person who is just another persona, like you and me. And that question itself came with an answer. I am reading for the exactly same reason; because he is like you and me. The beauty of this piece of work is that you will never see the protagonist there. It not Ravinder you see there and relate to. Instead you see yourself. As you turn more and more pages, your life comes in front of your eyes. Your first day at school... Those painful injections... Those friends made and lost... Those teachers and chapters... That first love and first heartbreak... That first failure and the lesson it taught... That innocence of a child and the naughtiness of a teenager... EVERYTHING.... EVERYTHING runs into your mind... Like a phantasmagoria! Therefore I say, folks, go for the book.